Aura (also known as Aura Angel) Rock Quartz crystal gemstone earrings by Diosa Jewellery. 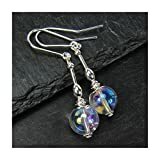 We have designed these earrings using these beautiful drops (10mm) with sterling silver ear wires and silver plated beads and bead caps. These AB crystals are created by taking natural quartz crystal formations and infusing them with pure Platinum. This gives an amazing opalescent sheen with a pinkish purple, blue and gold iridescence, like a pale rainbow. The earring length measures approximately 43mm in length. These unusual earrings are particularly suited to evening wear but are also suitable for day and casual wear due to their subtle iridescence.